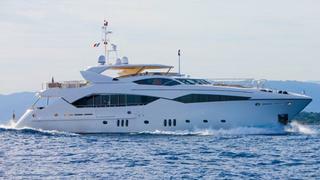 A quartet of Sunseeker brokers comes together to list the 39.12m motor yacht Le Volpi as Christopher Head and Harry Bristow-Holmes at Sunseeker London join Debbie Beere and Steve Handy at Dbeere Yachts to offer her for sale. Built in 2010, Le Volpi is the first and only Sunseeker 130 Predator to come on the market. MCA compliant, a stunning interior in satin walnut sleeps 12 guests in a master suite, two double staterooms and two twin cabins with Pullman berths. Twin 3460hp MTU engines push her to speeds of 26 knots. Le Volpi is asking £10,950,000.